Have you joined the #12daystwitter challenge? There’s a theme for each day and all you need to do is post something related to that theme. Then follow the #12daystwiter hashtag on twitter and connect with other educators.Â Great way to grow you personal learning network.Â If you’re a school librarian, I’ve gathered a list of the school library folks who are doing the #12dayschallenge. Might be a good way to find people to follow and connect with. 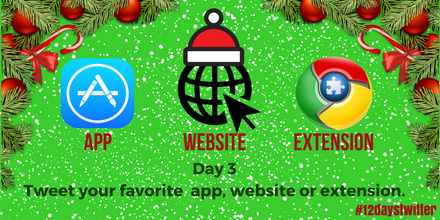 Day 3 is the day to share a favorite app, website or browser extension. So my current faves…. Nuzzel helps me keep up to date on the things that people are sharing via sharing social media without having to be on social media all day. Connect your Twitter account and it will show you the most shared links among the people you follow.Â And the most shared links by the people they follow. You can create your own newsletter with the items you find most interesting each day and then share that with others. And if you don’t want to use Nuzzel directly, you can subscribe to other people’s newsletters instead. Here’sÂ my newsetterÂ as an example. Feedly also helps me keep up to date on the latest news. This tool is a ‘feed reader’ and brings together all the blogs and news sources that I like to follow and lets me skim through the latest headlines from all of them in one place. Saves tons of time.Â And then I can share that news via twitter and/or add it to my Nuzzel newsletter. IFTTT is another handy productivity tool that ties different tools together. I use it to automatically save my Instagram photos to my Evernote account. And if I favorite/like something on Twitter, I have it set to sent those tweets to Evernote also. Evernote is my great big dumping ground! I use it on all my devices and can quickly and easily save notes, photos, pdfs, tweets, etc. And when I have time, I go back through and sort things out and file them away for future use. Good productivity tools to help you keep up and keep organized.